If there is one thing Norman Osborn cannot tolerate it is the lack of control. 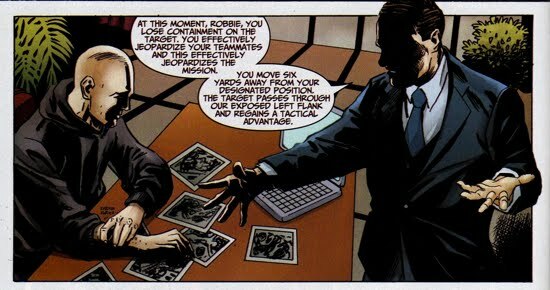 And the one man that perfectly embodied Osborn's inability to control his Thunderbolts team was Robbie Baldwin (aka Penance). Baldwin, unlike many of his team members, chose to be a Thunderbolt out of his own free will and therefore was not under any type of nanite restraint. 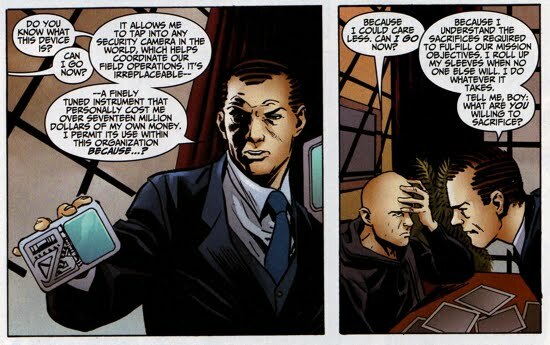 Baldwin's lack of a nanochain leash was one reason why Osborn had difficulty corralling him, yet there was plenty of other reasons why Osborn ultimately wanted Baldwin off of the roster. Baldwin's fragile mental state along with his seemingly uncontrollable power-set made him a liability in the field, and Norman does not care for liabilities. The dynamic between Osborn and Baldwin is explored further in the one-shot Thunderbolts: Desperate Measures, as Osborn conceived a plan that accomplished the next best thing to having Baldwin quit the team...have him get killed in the field! At the onset of the story Norman and Robbie reviewed footage (mostly photos) of the team's recent encounter with the unregistered superhuman Gorilla Girl. Osborn was not pleased with Baldwin's performance during the conflict and he criticized Baldwin's tactical errors as well as the overuse of his powers. 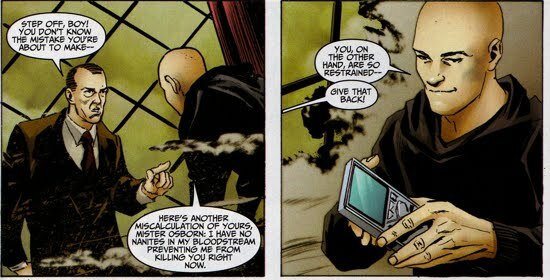 Osborn felt that Penance was unable to make the necessary sacrifices for the team to succeed, as opposed to Osborn himself who spent $17 million of his own money to purchase a device that allowed him unlimited access to security camera footage nationwide. Baldwin was not very receptive to any of Osborn's advice and then left Osborn's office. 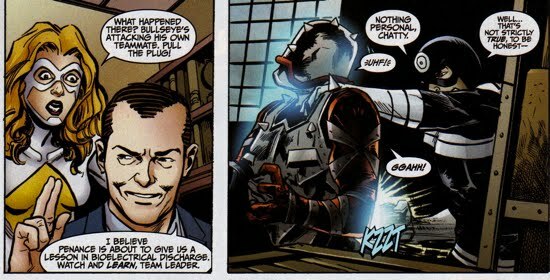 After Osborn's assistant, Miss Thompson, advised Osborn that murdering Baldwin was not a good idea, Norman selected the team's next unregistered superhuman target; Americop (aka Bartholomew Gallows). This particular vigilante operated out of Houston, Texas, so the team soon paid him a visit. Prior to their trip to Houston, Osborn met with Bullseye in the privacy of Bullseye quarters (aka his holding cell). Norman requested that Bullseye lead the next field mission and then explained his plan for getting Baldwin killed in action. The plan was simple, the team formed a perimeter around the Americop whilst Bullseye and Penance went on the attack in a cloaked motorcycle. 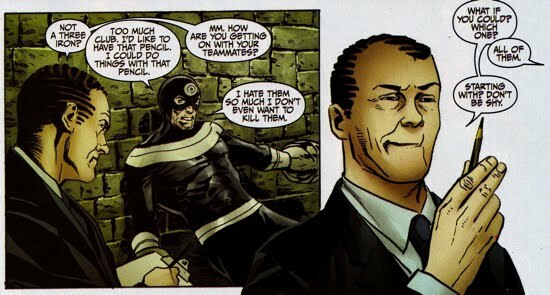 Osborn instructed Bullseye to bail out of the speeding motorcycle and to use it as the weapon against Americop. The kicker was to leave Penance in the motorcycle, sending him careening into the vulnerable Americop. Bullseye executed the plan, the problem was the Americop survived the crash and was able to neutralize Bullseye with an electrified net. After Penance's offensive was easily thwarted by Americop, Bullseye was forced to over the situation. Manipulating Penance's pain-based powers, Bullseye beats Penance mercilessly in order to get him to emit energy blasts. Bullseye's back-plan worked as Penance's powers cause the Americop to collapse to the ground. Talk about making a sacrifice for the team! Back at Thunderbolts Mountain, Robbie and Osborn recapped their latest mission in Houston. 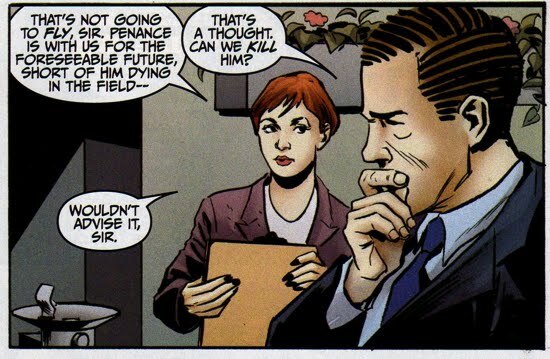 Unfortunately Norman did not notice any positive change in Penance's ability to be a solid team member. Baldwin, aimed at antagonizing Osborn, decided to show his boss the true extent of his powers. The former-Speedball destroyed Osborn's precious (and expensive!) security monitoring device right in front of his face. Osborn's response to that insubordinate act, "[Baldwin's] beginning to show potential".